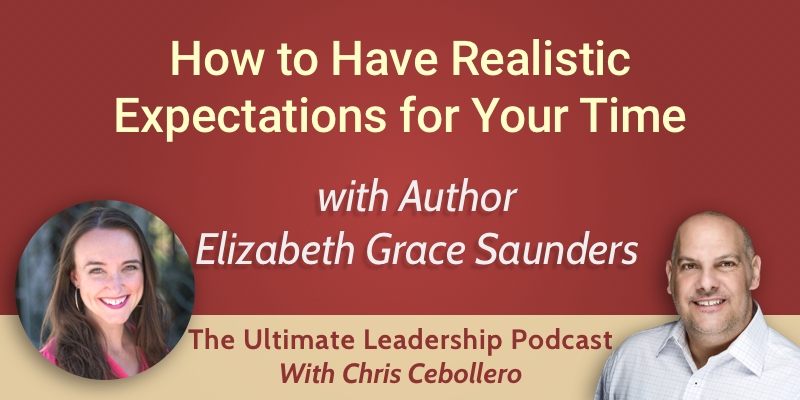 Our resident expert on time management, Elizabeth Grace Saunders, joins us again on The Ultimate Leadership Podcast to talk about time investment and having realistic expectations with your time. Last time we spoke to Elizabeth, she gave us some practical tips and tools we could use to effectively manage our time better. This time, we discuss how to approach organizing your time and how to stop feeling so overwhelmed and overloaded, to leave behind the guilt and to make you able to relax. Elizabeth had her own struggles with time investment, as she didn’t have realistic expectations on how much she could fit into a day or a week, or on how to balance work with the company she was running with life. She overcame her time investment problems and has been helping other people overcome theirs for eight and a half years. Tips on how to stop feeling overwhelmed and overloaded. Why do some people not want a sense of realistic time expectations? If you don’t have realistic expectations for your time, you will set yourself up for constantly feeling like a failure. Elizabeth uses the example of how you feel when working on a project which you believe will take eight hours. If it ends up taking ten hours, you are left feeling frustrated. If the project takes the eight hours you expected, you feel good. But if it takes fewer hours, you end the project feeling amazing. These feelings aren’t associated with how long the project took, but with your expectation of how long it would take. When you expect something to take a short amount of time and it takes longer, you beat yourself up unnecessarily, but if you are realistic with how long something will take you set yourself up for being and feeling like a success. It’s likely that you have realistic expectations for your time if you are consistently able to meet the deadlines you set for yourself and if you are always feeling good about what you are achieving. If you always feel like you’re behind, you’re not translating your work into your calendar to see if it fits, and you’re always saying yes to everything, Elizabeth says that you probably don’t have realistic expectations about how much you can fit into a day or a week. When you feel overwhelmed and overloaded by how much you’ve got going on, start out by identifying your time debt. If you are always running your schedule in time debt and committing to things which you don’t have time for, it will lead to stress. In Elizabeth’s book How to Invest Your Time Like Money, she explains that you must list out all different parts of your life and put down how much time is invested in each thing. Once you have listed and tallied up every part of your life, you can compare it to the time budget available to you in the day or week. Once you have figured out that some things don’t fit and have recognized you’re in time debt, you can start to take action from a place of empowerment rather than guilt. Make cuts from areas you consider to be lower priority, get to a balanced time budget and start to feel good about what you are doing. Elizabeth recommends starting to say no at least once a week, either to others or to yourself, to begin to get towards a more realistic place with your time. One of the things which is essential for people who are typically late or disorganized with their time is to come to terms with the fact that organization takes time to learn. It is important to remember that getting from one place to another takes time, as some people don’t think about the journey and how long it takes. Figure out what your step point is. If you’re often ten minutes late, tell yourself to be ten minutes early and aim for that. That way, you’re likely to be on time. Get into the habit of setting aside time for rituals, like cleaning the house or taking time in your schedule to file some paper. Once you recognize that being organized takes time, you’re able to put yourself in a place of feeling on top of things. A lot of people who are disorganized with their time think time has no limit, and so they get confused when reality wins and they end up being disappointed and overwhelmed. People who don’t want a sense of realistic time expectations are often angry and can’t understand why they aren’t able to do the 500 things in their head. Once the feelings of anger have been acknowledged, then they can be worked on to reach a place of acceptance. If you don’t tell someone they’re overloading you, they won’t know about it, so communication is essential. Take ownership of your time rather than putting yourself in a victim stance when you have too much on. You need to say no nicely, as it’s part of setting expectations of what is and isn’t reasonable. Saying no doesn’t have to be abrasive or offensive, it’s about being clear and knowing your schedule. Elizabeth has tips on how to say no and how to let people know what is realistic with her ‘Learn How to Say No’ resource.